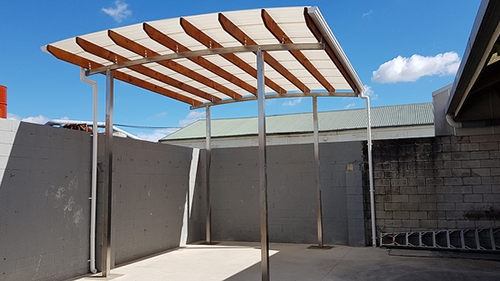 We can help you design our shelters to suit your commercial needs whether it be a covered Wash Bay, Milking Shed, Parking Shelter, Walkway or any area that requires that class business look at an affordable price and built to last out of 316 Stainless Steel combined with H3.2 SG8 timber. Look no further than Rotogola to come up with the perfect look for your business! Rotogola is proud to offer a strong and long lasting Unique quality NZ Made product that has been scientifically tested to withstand up to 700kg uplift and that's on each individual connection!! Designed with a combination of 316 Stainless steel and H3.2 Tantalized Kiln dried Structural Grade 8 Timber, making our product the obvious choice to the Commercial sector, especially in harsh environments or situations demanding a class finish and long lasting ability. 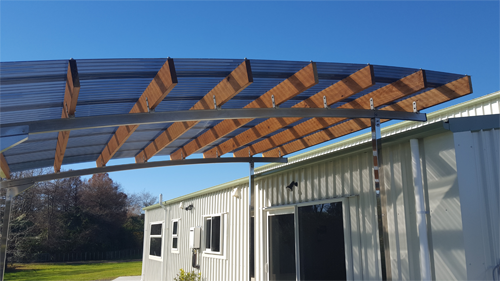 Be it a shelter off an existing commercial building, hospital, hotel, motel or in farming situations like Cow sheds or to cover a swimming pool or School area that needs to be protected with NZ's Premium Laserlite 99.9% UV Rated Polycarbonate roofing then look no further than Rotogola Elite Outdoor Shelters. We also supply complete stand alone units for use in any Commercial situation including wash bays, parking areas or just anywhere that needs a quality shelter. Rotogola Elite Outdoor Shelters can come up with the perfect solution for your Company's needs by assisting in designing to your requirements. We look forward to working with your business to add our Unique Rotogola Elite Outdoor Shelter products to your valued property.